Quintorris Lopez Jones was born on the 3rd February 1989 in Foley, Alabama USA, and as Julio Joneshe is known as a professional American Football player, who plays in the position of wide receiver in the National Football League (NFL) for the Atlanta Falcons. His professional career has been active since 2011. Have you ever wondered how rich Julio Jones is, as of early 2016? According to authoritative sources, it has been estimated that the total size of Jones’ net worth is over $8 million, which has been accumulated through his successful career as an NFL player. Julio Jones started playing football while he attended Foley High School; he played for the school team, and as he excelled in it, he participated in the High School Under Armour All-America Game. For his outstanding play, Jones was named All-American, and Gatorade T&F Athlete of the Year. After he matriculated from high school, Julio continued to play college football for the Crimson Tide of Alabama University. During his college career, Julio won several individual and team awards, including becoming the BCS Champion in 2010. Furthermore, he was named into the First-team All-SEC in 2009, and a year before he was named as the Freshman of the year by the Sporting News. 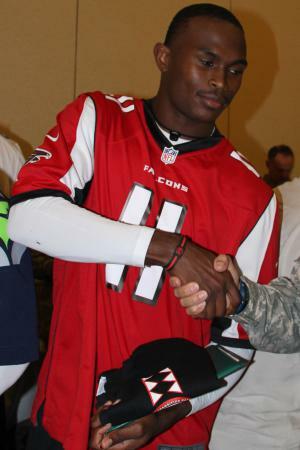 Julio`s professional career began in 2011, when he was selected as the 6th overall pick by the Atlanta Falcons in the 2011 NFL Draft, and has played for the team ever since. He signed a contract worth $16.2 million over four years, which certainly increased his net worth. In his rookie season, Julio had 54 receptions and 959 yards, and also had eight receiving touchdowns, which secured him first place among the rookies in the particular category. The following season his numbers increased further, recording 1,198 yards and 79 receptions, and he also had 10 touchdowns in all 16 games of the season. The 2013 season was jinxed for Julio as he played only in five games as he broke his foot, but he returned in 2014 with 1,593 yards and 104 receptions, plus six touchdowns. Thanks to his great game performance, Julio received a new contract worth $71.5 million over five years, increasing his net worth by a large margin. The 2015 season was his best so far, as he had 1.871 yards, and 136 receptions. Julio has also won several awards and recognitions thanks to his skills, including three appearances in the Pro Bowl game, in 2012, 2014, and 2015. Furthermore, in 2015 he was named into the First-team All Pro, and was also the NFL receiving yards leader. Julio had also been the NFC receiving yards leader in 2014 and 2015. Jones has also set several Atlanta Falcons records, including the single game receptions record with 13, among many others, which have only positively affected his career. When it comes to speak about his personal life, there is no information about Julio Jones’ private life, as he keep this to himself, however, in free time he is active on his official Twitter account.